Intela is a performance-based lead generation and email marketing company based in London. Intela leverages proprietary email and lead generation technologies to reach 30 million consumers worldwide and deliver high-quality, optimal volume results. 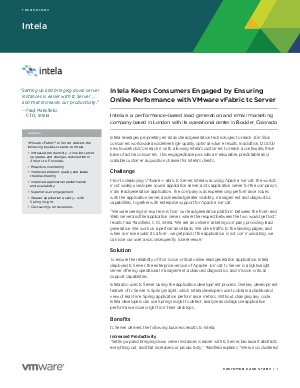 To ensure the reliability of its mission-critical online lead generation application, Intela deployed VMware vFabric tc Server. Read this case study to learn how tc Server helped Intela increase productivity, improve application performance and availability, save on costs and more.